In order to inculcate the value of love and pride for one’s nation, our school has always celebrated national festivals. The students and management actively participate in such functions. 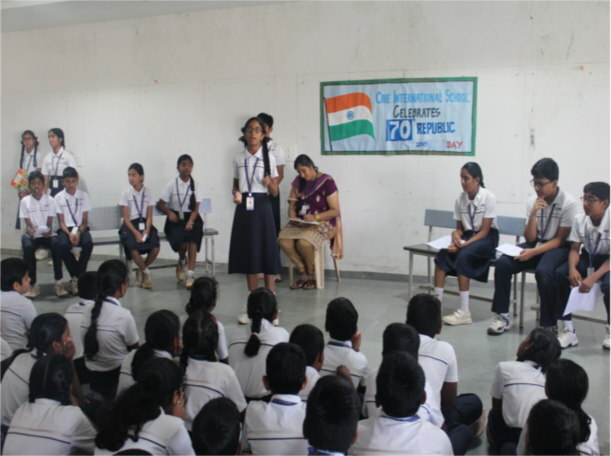 To mark the day, a special assembly was conducted, first national anthem was sung, followed by flag salute and oath. This was followed by speeches in Tamil, Hindi and English. The topic for the speeches were as follows: What is a Republic? Why do we celebrate Republic day? Fundamental Rights and Duties of an Indian Citizen. This was followed by a debate on: I want to live in a democracy. A patriotic song in Hindi was also rendered “MERA VATHAN KA LOGO AAK MAA BHAAR LO PANI”, A SONG WHICH PAYS HOMAGE TO THE MARTYS. The students from class I to V also had a special assembly in which they sang the National Anthem and gave a speech on the importance of living in a democratic republic. The primary block was shown a patriotic movie on the life of freedom fighters. Our principal addressed the students and asked them as students to do their best for their nation by studying hard, respecting their elders, parents, being honest, respecting the national ideals and always appreciate what the nation has done for them. Our senior principal mam also addressed the students on the importance of living in a democratic republic. The assembly was drawn to a close by singing of the national song. Jai Hind!